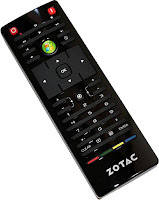 If you own a Zotac ZBOX or similar hardware with the included MCE remote, you can find that upon compiling lirc in Gentoo, that the remote is not fully configured and not all buttons work. In this case you have two choices: configure the remote as default an map the buttons manually or use information in this post to compile lirc with zotac remote support and enable all buttons. I've already filled a bug in Gentoo's Bugzilla to add the source to the main portage tree in order to avoid the following steps. The files you will need right now are: lirc_ebuild.patch and zotac.patch use left-click + save target as... These files will add the needed sources to compile the zotac remote and patch the actual portage ebuild of lirc, letting you reinstall it with the new added sources. Once finished with the patchs and configuration, we can recompile lirc. The new version of lirc will have the zotac remote compiled and all the buttons mapped. This works almost out of the box on XBMC and I'm sure it works also in similar systems. This way it won't be recompiled when you update the portage tree. i'm loosing mi mind i can't patch it. i got the hunk 3 of 3 error. Sorry, I didn't add the last step. Once you patch the portage files, you need to go to the package dir (cd /usr/portage/app-misc/lirc) and run 'ebuild lirc-0.9.0-r2.ebuild manifest', so the Manifest file is updated with the correct hash. Once you do this, you should be able to emerge without problems.